Nanjwade, B., Derkar, G., Bechra, H., Manvi, F. (2010). Nanosized Technological Approaches for the Delivery of Poorly Water Soluble Drugs. Iranian Journal of Pharmaceutical Sciences, 6(3), 149-162. Basavaraj K. Nanjwade; Ganesh K. Derkar; Hiren Bechra; F. V. Manvi. "Nanosized Technological Approaches for the Delivery of Poorly Water Soluble Drugs". 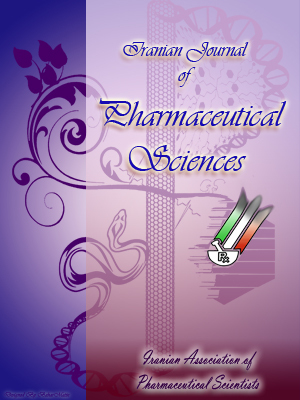 Iranian Journal of Pharmaceutical Sciences, 6, 3, 2010, 149-162. Nanjwade, B., Derkar, G., Bechra, H., Manvi, F. (2010). 'Nanosized Technological Approaches for the Delivery of Poorly Water Soluble Drugs', Iranian Journal of Pharmaceutical Sciences, 6(3), pp. 149-162. Nanjwade, B., Derkar, G., Bechra, H., Manvi, F. Nanosized Technological Approaches for the Delivery of Poorly Water Soluble Drugs. Iranian Journal of Pharmaceutical Sciences, 2010; 6(3): 149-162. A major hurdle in pharmaceutical formulation is water insolubility of most of drugs affecting their stability and bioavailability. If the drug is also insoluble in organic medium, it is difficult to deliver it in a sufficiently bioavailable form and hence it is a great challenge to formulation researchers to overcome such difficulty. Although some approaches are available for enhancing the dissolution of poorly soluble drugs, there has been certain draw backs like use of organic solvents, low drug loading and large doses. However, a new solution to poorly water soluble drug candidates is now available, i.e. nanonisation that leads to much more soluble, more biologically available and safer dosage form of poorly soluble and poorly bioavailable drugs. Controlled release of these drugs is also possible by forming nanostructured matrices. In this article, a brief description of production methods of drug nanoparticles and commercialized methods are presented along with brief overview on second generation of drug nanocrystal (Smart crystal technology), controlled release of hydrophobic drugs and recent works thereof are also presented. It has been estimated that roughly 40% of all investigational compounds fail development because of poor bioavailability that is often associated with aqueous insolubility. On average, according to the tufts center for the study of drug development, only five out of every 5,000 potential drugs are actually tested in clinical trials, and of these only one will eventually be approved for use in patients . Currently, there are a limited number of formulation approaches available for compounds that are poorly soluble in water e.g. solubilisation, cosolvency, complexation with beta-cyclodextrin and solid dispersion can enhance a drug’s dissolution . Although, some of these approaches have been successfully utilized, especially for highly potent compounds with low dose requirements, but there is also a need to improve the delivery of poorly soluble drugs because of environmental concerns (use of organic solvents). Meanwhile classical formulation approach for such poorly soluble drugs is micronisation that means transfer of the coarse drug powder to an ultrafine powder with a mean particle size being typically in the range of 2-5 µm. Micronisation was or is a technology for case II drugs of the biopharmaceutical classification system (BCS), i.e. drugs having a good permeability but a low bioavailabili-ty due to their poor solubility and low dissolution velocity . But for the colonic drug delivery, micronisation often results in a low and varying bioavailability. In the recent years, nanoparticle technology has emerged as a strategy to tackle such formulation problems associated with poorly water soluble and poorly water and lipid soluble drugs. The reduction of drug particle to the nano-scale increases dissolution velocity and saturation solubility, which leads to improved in vivo drug performance . Hence the next step was taken to improve saturation solubility, dissolution velocity and thereby improving bioavailability of drugs by reducing the particle size from micron size to nano size level, one such approach to increase the solubility of such problematic drugs is the nanonisation. The purpose of this paper is to give brief description of methods for production of drug nanoparticle and nanocrystals for poorly soluble drugs; a brief overview on controlled release of hydrophobic drugs, second generation of drug nanocrystals and recent advances and work done in nanoparticulate technology. There are two principle methods for the production of drug nanoparticles for poorly soluble drugs: the first is disintegration method which includes communition of particles to smaller size and the second is nucleation of particles from the molecular state. Different processes are used such as pearl milling, high pressure homogenization, emulsification method, rapid expansion, and spray freezing to produce drug nanoparticle. The drug is dispersed in an aqueous based surfactant solution and the obtained suspension is then feed into pearl mill with the aid of milling media [2, 5]. Drug nanoparticles are produced by impaction of drug particle with milling media by generating energy which is required for reduction of particles into nano level. Zirconium oxide stabilized with zirconium silicate, or a highly cross linked polystyrene resin (0.4-3.0 nm diameter) is used as milling media. Temperatures less than 40 °C and pressures as high as ~ 20 psi are used for this purpose. The time of milling depends on hardness of the drug ranging from hours to days together. Liversidge and Cundy have prepared danazol nanocrystal suspension by pearl milling technique and showed that bioavail-ability of danazol is improved as high as 82.3% compared to commercial danazol suspension which is only 5.2% . Similarly, naproxen nanocrystal prepared by using pearl milling showed improved bioavailability compared to naprosyn (naproxen suspension, Roche, Geneva Switzerland) and Anaprox (naproxen tablet, Roche) [2, 7]. For injectable products, nanocrystals suspension increases drug loading, which is shown by the anticancer drug paclitaxel; Liversidge et al. have shown that paclitaxel when formulated as nanosuspension was better tolerated than the marketed product Taxol (Bristol-Myers Squibb, New York, NY) which uses cremophor-ethanol mixtures . One limitation of wet milling is that products can become contaminated because of abrasionoccurring on grinding beads, which is intolerable for parenterally administered drugs. Other limitations are the possibility of only batch wise production and variations in particle-size distribution . In contrast, only limited feed is subjected to size reduction during wet milling. In this process pre-suspension of drug is prepared by using aqueous surfactant solution. This pre-suspension is then passed through very small gap (~25 mm) of high-pressure homogenizer, cavitation forces are developed which are enough to disintegrate larger particles in to smaller nano size particles. Here the homogenization pressure and the number of homogenization cycles is very important to optimize the process. Generally 100 to 1500 bar pressure for 3, 5, 10 homogenization cycles are used depending upon drug hardness [10-12]. This process is suitable for laboratory as well as for large scale production. The main advantage of high-pressure homogenization is that it is suitable for both large- and laboratory-scale production, because high-pressure homogenizers are available in various sizes. In addition, homogenization creates negligible nanoparticle contamination, which is one of the most important objectives of a nanoparticle production process. In addition, the dissolution and bioavailability of poorly soluble drugs is improved. Scholer et al. found that the bioavail-ability of atovaquone, a drug used to treat leishmaniasis, was increased by formulating it as nanosuspension . In comparison with micronized drugs, nanosuspensions of atovaquone at equivalent doses reduced infectivity from 40% to 15% at a reduced concentration of 7.5 mg/kg. Drug load decreased from 22.5 (micronized drug) to 7.5 mg/kg (nanosuspension), but the activity was increased by 2.5-fold at the same time . Kayser et al. found that the bioavailability of amphotericin B, a highly effective antimycotic and leishmanicidal drug, was enhanced by formulating it as nanosuspension . In a comparison with commercial crude amphotericin B (micronized drug particles) and intravenous administered liposomes entrapping amphotericin B, drug absorption markedly improved. This effect confirms the ability of nanosuspensions to increase bioavailability. In a recent study, the dissolution characteristics of nifedipine were significantly increased with regard to the commercial product by preparing nanocrystals using high-pressure homogenization. After 60 min, 95% of drug nanocrystals were dissolved and ~5% of the unmilled drug was dissolved . Nanosuspensions also eliminate the possibility of Ostwald ripening (i.e., the growth of larger particles at the dispense of smaller ones), thereby facilitating physical long-term stability as an aqueous suspension. Ostwald ripening is caused by different saturation solubility of differently-sized particles that are near each other, and the concentration gradient between them. Molecules from the more highly concentrated solution around very small particles diffuse to the vicinity of larger particles where a lower concentration is present. This effect leads to supersaturation, drug crystallization, and, thus, the growth of the larger particles. Ostwald ripening does not occur in nanosus-pensions, because the homogenization process makes only uniform particle sizes . A limitation of this process is that the pressure used is so high that in some cases, the crystal structure changed. This effect leads to increased amorphous fraction . The variation in crystallinity can result in instability and also poses quality control problems. Emulsification also can be used to prepare nanocrystal suspensions. In this method, the drug solution in an organic solvent is dispersed in the aqueous phase containing surfactant. This step is followed by the evaporation of organic solvent under reduced pressure, which results in the precipitation of drug particles to form a nanocrystal suspension which is stabilized by the added surfactant. Alternatively, the nanocrystal suspension can be obtained by diluting an emulsion prepared by conventional methods, which results in the complete diffusion of the internal phase into the external phase leading to nanocrystal suspension. By forming drug nanosuspen-sions using emulsification technology, the mitotane anticancer drug dissolution rate was increased by five- fold compared with commercial products . The use of microemulsion as templates for producing drug nanosuspensions also has been reported in the literature. The dissolution rate of the antifungal griseofulvin drug was enhanced three-fold compared to the commercial products by formulating a nanosuspension using microemulsion . The emulsification technology cannot be used for drugs that are poorly soluble in both aqueous and organic media. Moreover, the use of organic solvents also poses environmental concerns. In the PCA process (patented by RTP Phar-maceuticals and licensed to SkyePharma Plc, London, UK), supercritical carbon dioxide is mixed with organic solvents containing drug compounds. The solvent expands into supercritical carbon dioxide, thus increasing the concentration of the solute in the solution, making it supersaturated, and causing the solute to precipitate or crystallize out of solution. Microparticles and nanoparticles are formed after drug precipitation by mass transfer because of organic solvent extraction into carbon dioxide and the diffusion of carbon dioxide into the droplets [18, 19]. High mass-transfer rate is important to minimize particle agglomeration and reduce drying time [20. Hanna and York attempted to increase the mass transfer rate by using a coaxial nozzle design with a mixing chamber. In this process, the drug in organic solvent interacts with the compressed fluid carbon dioxide antisolvent in the mixing chamber before dispersion and then flows through a restricted orifice into a particle-formation vessel. The high frictional surface forces that are generated cause the solution to disintegrate into droplets . This process was further modified by Subramaniam et al. who used an ultrasonic nozzle-based process for producing discrete nanoparticles in a narrow size range. A key step in the formation of nanoparticles is to enhance the mass transfer rate between the droplets and the antisolvent before the droplets coalesce to form bigger droplets. With an ultrasonic nozzle, the sound waves assist the antisolvent's disintegration into small droplets, thereby increasing the interfacial area. In addition, the turbulence created by the focused sound waves also enhances the mass transfer rate between the droplets and carbon dioxide. Sound waves, rather than inertial or frictional forces, are exploited for droplet formation. Hence, the diameter of the line into which the spray solution is introduced can be larger than that of either capillary or micro-orifice nozzles . This larger diameter allows for higher solution throughput and reduces the probability of nozzle plugging, thereby dramatically increasing manufacturing efficiency. In RESS process, a solution or dispersion of phospholipids or other suitable surfactant in the supercritical fluid is formed. Then, rapid nucleation of drug is induced in the supercritical fluid containing surfactant. This process allows rapid, intimate contact of the drug dissolved in supercritical fluid and the surfactant which inhibits the growth of the newly formed particles [23, 24]. This process was used by Young et al. to prepare nanoparticles of cyclosporine in the size range of 500–700 nm . Tween-80 solution was used as a surfactant to prevent flocculation and agglomeration of nanoparticles. Researchers reported that the cyclosporine particles formed by this process could be stabilized for drug concentrations as high as 6.2 and 37.5 mg/ml in 1.0 and 5% (w/w) Tween-80 solutions. RESS process was combined with highpressure homogenization by Pace et.al. to prepare a physically stable nanosuspension . In this process, the poorly soluble drugs and surface modifier were first dissolved in a liquefied, compressed gas solvent, which was subsequently expanded into an aqueous solution containing surfactant. The suspension so formed was further subjected to highpressure homogenization process to produce a stable nanosuspension . In this process, developed at the University of Texas at Austin (Austin, TX) and commercialized by Dow Chemical Company (Midland, MI), an aqueous, organic, or aqueous-organic co-solvent solution; aqueousorganic emulsion; or drug suspension is atomized into a cryogenic liquid such as liquid nitrogen to produce frozen nanoparticles which are subsequently lyophilized to obtain free-flowing powder [27-31]. The rapid freezing rate caused by the low temperature of liquid nitrogen and the high degree of atomization resulting from the impingement occurring between drug solution and cryogenic liquid leads to the formation of amorphous nanoparticles. Apart from liquid nitrogen, the drug solution also can be atomized into compressed fluid carbon dioxide, helium, propane, or other cryogenic liquids such as argon or hydrofluoroethers. Highly potent danazol nanoparticles contained in larger structured aggregates were produced by the SFL process . The SFL powders exhibited significantly enhanced dissolution rates. The micronized bulk danazol exhibited a slow dissolution rate; only 30% of the danazol was dissolved in 2 min. Nonetheless, 95% of danazol was dissolved in only 2 min for the SFL highly potent powders. In another study, SFL danazol/PVP K-15 powders with high surface areas and high glass transition temperatures remained amorphous and exhibited rapid dissolution rates after 6 months in storage . Table 1. Nanoparticulate technologies to improve the delivery of poorly soluble drugs. to be improved solubility of hydrophobic drugs. hydrophilic drugs for oral delivery. * It is an emerging drug delivery company. The EPAS process also was developed by the University of Texas at Austin and commercialized by Dow Chemical Company. In this process, the drug solution in a low boiling liquid organic solvent is heated under pressure to a temperature above the solvent's normal boiling point and then atomized into a heated aqueous solution containing stabilizing surfactant . The surfactant also can be added to organic solvent along with an aqueous solution to inhibit crystallization and growth of nucleating drug particles. The EPAS process was used to produce nanoparticle suspensions of cyclosporine A and danazol, which showed high dissolution rates. Nanoparticle suspensions produced by the EPAS process can be incorporated into a parenteral dosage form or can be dried to produce solid oral dosage forms [35, 36]. In another study, danazol particles formed by both EPAS and SFL processes produced amorphous powders with high glass transition temperature and low contact angle values. The dissolution rates were faster for the SFL particles, although both techniques enhanced dissolution rates of the active ingredient . Nanocrystal technology (Elan Corporation, Dublin, Ireland) can be used to formulate and improve compound activity and final product characteristics of poorly water-soluble compounds. The nanocrystal technology can be incorporated into all parenteral and oral dosage forms, including solid, liquid, fast-melt, pulsed-release, and controlled-release dosage forms. Nanocrystal particles are produced by milling the drug substance using a proprietary wet-milling technique [2, 5]. The nanocrystal drug particles are stabilized against agglomeration by surface adsorption of selected generally regarded as safe (GRAS) stabilizers. The result is an aqueous dispersion of the drug substance that behaves like a solution -a nanocrystal colloidal dispersion that can be processed into finished dosage forms for all routes of administration. For example, the rapamune (sirolimus, Wyeth, Madison, NJ) immunosuppressant tablet developed with nanocrystal technology is designed to give patients more convenient administration and storage than the oral solution. Nanocrystal technology is an enabling technology for evaluating new chemical entities that exhibit poor water solubility. In addition, it is a valuable tool for optimizing the performance of established drugs. Other than oral route nanocrystal formulation can also be administered by dermal, ophthalmic, nasal, vaginal, pulmonary and parenteral route. Nanocrystals are also surface modified to absorb the blood proteins for specific localization e.g. in the brain or the bone marrow. Various nanotechnologies already have been commercialized to help deliver poorly water-soluble drugs into the body. A review of some of these technologies will follow. Table 2. Commercial products produced by different companies using Elan nanocrystal technology. Dissocubes technology (a patented technology currently owned by SkyePharma Plc) is based on piston-gap high- pressure homogenization (APV Micron LAB 40, APV Deutschland GmbH, Lubeck, Germany) and has already been described. The main advantages of this technology are ease of scale-up, little batch-to-batch variation, and aseptic production for parenteral administration. Nanomorph technology (Soliqs Abbott GmbH & Co. Kg, Ludwigshafen, Germany) converts drug substances with low water solubility from a coarse crystalline state into amorphous nanoparticles. Nanomorph technology is based on a dissolution-precipitation concept that operates using water-miscible solvents for dissolution, followed by precipitation by aqueous polymer solutions. In this technology, the drug suspension in solvent is fed into a chamber, where it is rapidly mixed with another solvent. Immediately, the drug substance suspension is converted into a true molecular solution. The admixture of an aqueous polymer solution induces precipitation of the drug substance. The polymer keeps the drug substance particles in their nanoparticulate state and prevents them from aggregation or growth. Water redispersable dry powders can be obtained from the nanosized dispersion by conventional methods (e.g. spray drying). Nanomorph formulations can be incorporated into the whole range of standard galenic application forms. Nanoedge technology (Baxter Healthcare Corporation, Deerfield, IL) is a formulation toolbox for poorly water-soluble drugs. It is a useful technology for active ingredients that have high melting points and high octanol-water partition coefficients, log P. It is based on direct homogenization, micro-precipitation, and lipid emulsions. In microprecipitation, the drug first is dissolved in a water-miscible solvent to form a solution. Then, the solution is mixed with a second solvent to form a presuspension and energy is added to the presuspension to form particles having an average effective particle size of 400 nm to 2 μm . The energy-addition step involves adding energy through sonication, homogenization, countercurrent flow homogenization, microfluidization, or other methods of providing impact, shear, or cavitation forces. A drug suspension resulting from these processes may be administered directly as an injectable solution, provided water-for-injection is used in the formulation and an appropriate means for solution sterilization is applied. Nanoedge technology facilitates small particle sizes ( < 1000 nm [volume weighted mean]), high drug loading (10-200 mg/ml), long-term stability (up to 2 years at room temperatures as low as 5 °C), the elimination of co-solvents, reduced levels of surfactants, and the use of safe, well-tolerated surfactants. In nanopure technology (PharmaSol GmbH, Germany), poorly water-soluble drugs are transferred to drug nanocrystals via a high-pressure homogenization process . The drug powder is dispersed in a surfactant solution and the forces in the high-pressure homogenizer are strong enough to disintegrate the coarse drug powder into drug nanoparticles with a mean diameter, typically between 200–600 nm. The drug powder is dispersed in a nonaqueous medium (e.g. PEG 600, Miglyol 812) or a water-reduced mixture (e.g. water-ethanol) and the obtained presuspension is homogenized in a piston-gap homogenizer. A suitable machine for the laboratory scale is the Micron Lab 40 (APV Deutschland GmbH). Nonaqueous dispersion media such as PEG or oils yield suspensions that are suitable for the direct filling of capsules and thus an intermediate step required when using pure aqueous nanosuspensions is avoided. With nanopure technology, homogenization can be performed in a nonaqueous phase or phases with reduced water content. And, in contrast to more pronounced cavitation at higher temperatures, homogenization was similar or more efficient at lower temperatures, even below the freezing point of water. Crititech technology (CritiTech, Inc., Lawrence, KS) is based on PCA. Crititech uses ultrasonic energy produced by a converging-diverging nozzle or an electro-mechanical oscillator to shatter droplets into even droplets. This technique alone would not cause submicron particles to form because the droplets tend to coalesce immediately into larger drops. In the crititech procedure, the drug-laden solvent is sprayed into a flowing stream of supercritical carbon dioxide, which allows for a rapid mass transfer of solvent into the stream of supercritical carbon dioxide. This rapid mass transfer forces precipitation or crystallization to occur before the coalescence of droplets. The ultrasonic nozzle-based process is capable of producing discrete nanoparticles in a narrow size range . Moreover, crititech's proprietary particle-harvesting device allows continuous processing of compounds in closed systems with complete recovery of solvents and carbon dioxide for reuse or safe disposal. Nanocochleate delivery vehicles (also known as bioral technology) are a broad-based enabling technology for the delivery of many therapeutic products. These molecules are stable phospholipid-cation precipitates composed of simple, naturally occurring materials such as phosphatidylserine and calcium. They consist of alternating layers of phospholipid and multivalent cations existing as stacked sheets, or continuous, solid, lipid bilayer sheets rolled up in a spiral configuration, with little or no internal aqueous space. Unique properties of nanocochleates have been used to mediate and enhance the oral bioavailability of a broad spectrum of important but difficult-to-formulate biopharmaceuticals, including compounds with poor water solubility, protein and peptide drugs, and large hydrophilic molecules. Nanocochleate formulations are widely suitable to a broad range of therapeutic applications which include the oral delivery of amphotericin B (bioral amphotericin B); large DNA constructs and plasmids (bioral DNA vaccines and bioral gene therapy); peptide formulations; anti-inflammatory formulations (bioral aspirin); and peptide-based vaccines. CFC (Five Star Technologies, Cleveland, OH) can be used to develop advanced materials for emerging applications and to design processes that enhance existing products and processes. CFC technology is based on hydrodynamic cavitation, which involves the formation, growth, and implosive collapse of vapor bubbles in a liquid created by fluctuations in fluid pressure. In this process, the formation, size, density, speed of collapse, intensity of implosion and other energetic of cavitation bubble creation and collapse are controlled to produce the necessary energy dissipation levels and desired effects on the process medium . Second generation of drug nanocrystal is also known as Smart Crystal Technology. In this technology, drug nanocrystals are produced by dispersing a drug in a lipidic dispersion media. By combining a pretreatment process with high pressure homogenization, the obtained drug nanocrystal suspension (nanosuspension) shows an increased physical stability. Freeze-drying along with subsequent high pressure homogenization, nanocrystals as small as 50 nm were obtained (amphotericin B) . Intravenous administration of nanosuspension can be improved by this technology. Targeting of toxicity to the mononuclear phagocytic system (MPS) cells can be avoided by producing drug nanocrystal to very small size leading to very fast dissolution, but for targeting to particular site, drug nanocrystals should be of larger size but they need to be surface-modified to avoid recognition by mononuclear phagocytic system (MPS) cells and having the potential to be directed to target sites (e.g. Brain). Effective controlled release technology focus on solid dose formulations of hydrophobic compounds rather than lipid based systems . Solid dosage forms of poorly soluble drugs are simple and less expensive to develop. The majority of controlled release formulations are often associated with an initial burst of enhanced solubility but failing to ensure complete delivery and absorption of the drug dose. The drugs in biopharmaceutical classification system (BCS) class II category when formulated with surfactant for increasing their solubility and dissolution, high concentration of this surfactant will suppress it. New methods are also developed for prolonging controlled release of oral drugs such as nifedipine and glipizide from hydrophilic matrices, which is based on electrolytic control of PH and formation of hydrophobic associations and hydrostatic interaction in the matrix using polar or amphoteric excipients . In nanotechnology, structuring of biocompatible nanomatrices for controlled release of drug is possible as there is total absence of chemical modifications of the matrix which is suitable for particular drug and thus reduces complexity of drug delivery system as well as reduces toxic potential also. Nanostructured matrices provide consistency in drug release kinetics and loading efficiency. Nanostructured silicon is an emerging material which gives consistency in controlled release of drug as well as it increases bioavailability of hydrophobic drugs, nanostructured silicon is biodegradable and the kinetics of drug release depends on the rate of biodegradation of matrix. Porosity of this matrix system increases the solubility of hydrophobic drugs, it also allows very high drug loading potential compared with other carriers . A recent nanoparticulate technology for the delivery of poorly soluble drugs is given in Table 1. Four products of Elan were approved in United State, based on nanocrystal technology. Different companies have launched their product based on Elan nanocrystal technology as given in Table 2. Elan has also pact with Abbott and AstraZeneca for combination product of fenofibrate and AstraZeneca’s (London) Crestor (rosuvastatin) which uses nanocrystal technology. Elan have partnership with Johnson and Johnson (J and J, New Brunswick, NJ) in Johnson and Johnson long acting injectable form of paliperidone which is under development uses nanocrystal technology of Elan. Baxter healthcare have Nanoedge dispersion technology which uses two complementary processes homogenization and precipitation. Psivida (Perth, Australia) pact with Pfizer for ophthalmic delivery signed with $165 million, gives right to develop and commercialized BioSilicon; e.g. Brachysil for Brachy therapy treatment in phase II trials produced by Psivida uses BioSilicon technology which is currently licensed to Beijing MedPharm corp. (Plymouth meeting, PA). A nanotechnology company Arrowhead research corporation (Pasadena, CA) has his branch Insert therapeutics (Pasadena, CA) is using Nanoengineered polymeric drug delivery system “Cyclosert” for the delivery of small molecules and nucleic acids. This technology is licensed to R&D Pharmaceuti-cals GmbH (Planegg, Germany) by Insert therapeutics to deliver the anticancer agent tubulysin A. also R&D Pharmaceuticals recently signed pact with Insert therapeutics to use the nanotechnology in developing epothilones microtubule depolymerization inhibitors used as anticancer therapies. Insert therapeutics is also licensing this technology to Calando pharmaceuticals (Pasadena, CA) which develops small interfering RNA (Si RNA) therapeutics; e.g. CALAA-OL, a nanoparticle containing nanochemically modified Si RNA a Calando’s lead drug candidate. Also Rondee (RNA/Oligonu-cleotide nanoparticle delivery) is Calando’s lead drug candidate formulated using this technology with transferring protein targeting agent. “Flash nanoprecipitation” technique was recently developed by Researchers at Princeton University (Princeton, NJ), in this technology two streams of liquid are directed toward one another in a confined area. The first stream consists of an organic solvent that contains the drug and polymer, and the second stream contains pure water, outlines the release. When the streams collide, the hydrophobic drug and polymers precipitate out of solution, and the polymers immediately self-assemble onto the drug cluster to form a coating with the hydrophobic portion attached to the nanoparticle core and the hydrophilic portion stretching out into the water. By carefully adjusting the concentrations of the substances and the mixing speed, the sizes of the nanoparticles can be controlled. The stretched hydrophilic polymer layer keeps the particles from clumping together and prevents recognition by the immune system so that the particles can circulate through the bloodstream. Researchers at the University of Pennsylvania School of medicine and school of engineering and applied Science (Philadelphia, PA) used a cylindrical carrier to sustain delivery of the anticancer drug paclitaxel to an animal model of lung cancer 10 times longer than that delivered on spherical-shaped carriers, according to an April 2007 university release. The research team used skinny cylindrical nanoparticles composed of synthetic polymers to deliver the anticancer drug paclitaxel to human lung tumor tissue implanted in mice. The cylinders have diameters as small as 20 nm and lengths approaching the size of blood cells. The paclitaxel shrunk the tumors, and because the cylinders remained in circulation for up to one week after injection, they delivered a more effective dose, killing more cancer cells and shrinking the tumors to a much greater extent, an improvement over spherical nanoparticles . Magnetic nanocrystalline iron-nickel alloys is another nano-based advance in drug delivery. Researchers at the University of Louisiana at Lafayette (Lafayette, LA) prepared magnetic nickel ferrite nanocrystals coated with the biocompatible polymer poly-methacrylic acid (PMAA) and developed methods of hooking the anticancer agent doxorubicin to the ends of the PMAA chains . Drug nanocrystal technology is the universal approach and the simplest way for the delivery of poorly soluble drugs, this technology can be easily scaled up for industrial production. Controlled release of poorly soluble drugs is also possible by using nanostructuring material it not only provides controlled release of the drug but also increasing the bioavailability of hydrophobic drugs. On the other hand second generation of drug nanocrystal i.e. Smart Crystal Technology has shown to improve intravenous administration of nanosuspension. Targeted delivery to the brain is also possible by this system. The researches are going on in various industries and in academics to overcome the problem of delivery of poorly soluble drugs. Further research and development in this area may completely solve this critical problem in future. Merisko LE, Liversidge GG, Cooper ER. Nanosizing: a formulation approach for poorly-water-soluble compounds. Eur J Pharm Sci. 2003; 18: 113-20. Keck. CM, Müller. RH. Drug Nanocrystals of poorly soluble drugs produced by high pressure homogenization. Eur J Pharm Biopharm. 2006; 62: 3-16. Muller RH, Bohm BHL. Nanosuspensions, in emulsions & nanosuspensions for the formulation of poorly soluble drugs. Stuttgart, Germany: Medpharm Scientific Publishers, 1998; pp. 149–74. Liversidge GG. Surface modified drug nanoparticles, 1992. US Patent No. 5145684. Liversidge GG, Cundy KC. Particle size reduction for improvement of oral bioavailability of hydrophobic drugs: I. Absolute oral bioavailabil-ity of nanocrystalline danazol in beagle dogs. Int J Pharm. 1995; 125: 91–7. Liversidge GG, Conzentino P. Drug particle size reduction for decreasing gastric irritancy and enhancing absorption of naproxen in rats. Int J Pharm. 1995; 125:309–13. Merisko LP, Sarpotdar J, Bruno S, Hajj L, Wei N, Peltier J, Rake JM, Shaw S, Pugh, Polin L. Formulation and antitumor activity evaluation of nanocrystalline suspensions of poorly soluble anticancer drugs. Pharm. Res. 1996;13: 272–8. Müller RH, Jacobs C, Kayser O. Nanosuspensions as particulate drug formulations in therapy: Rationale for development and what we can expect for the Future. Adv Drug Del Rev. 2001; 47: 3–19. Jacobs C, Kayser O, Müller RH. Nanosuspensions as a new approach for the formulation for the poorly soluble drug tarazepide. Int J Pharm. 2000; 196: 161–4. Muller RH. Nanosuspensions: A formulation approach for poorly soluble and poorly bioavailable drugs. Handbook of Pharmaceutical Controlled Release Technology. Wise. D.L. ed. New York: Marcel Dekker Inc, 2000; pp. 345–57. Muller RH. Nanosuspension for the formulation of poorly soluble drugs, in pharmaceutical emulsion and suspension. Neilloud. F. ed. and Marti-Mestres. G. ed. New York: Marcel Dekker Inc, 2000; pp. 383–407. Scholer N. Atovaquone nanosuspensions show excellent therapeutic effect in a new murine model of reactivated toxoplasmosis. Antimicrobial Agents Chemotherapeutics. 2001; 45: 771–9. Kayser O, Olbrich C, Yardley V, Kiderlen AF, Croft SL. Formulation of amphotericin B as nanosuspension for oral administration. Int J Pharm. 2003; 254:73–5. Hecq J, Deleers M, Fanara D, Vranckx H, Amighi K. Preparation and characterization of nanocrystals for solubility and dissolution rate enhancement of nifedipine. Int J Pharm. 2005; 299:167–77. Trotta M, Gallarate M, Pattarino F, Morel S. Emulsions containing partially water-miscible solvents for the preparation of drug nanosuspen-sions. J Control Release 2001;76:119–28. Trotta M, Gallarate M, Carlotti ME, Morel S. Preparation of griseofulvin nanoparticles from aater-dilutable microemulsions. Int J Pharm. 2003;254:235–42. Dixon DJ, Bodmeier RA, Johnston KP. Polymeric materials formed by precipitation with a compressed fluid antisolvent. AIChE J. 1993; 39:127–39. Reverchon E. Porta. GD. Production of antibiotic micro- and nano-particles by supercritical antisolvent precipitation. Powder Technol. 1999;106:23–9. Chattopadhyay P. Gupta RB. Protein nanoparticles formation by supercritical antisolvent with enhanced mass transfer. AIChE J. 2002; 48: 235–44. Hanna M.H. York P. Method and apparatus for the formation of particles. 1998. US Patent No. 5851453. Subramaniam B. Methods for a particle precipitation and coating using near-critical and supercritical antisolvents. 1997. US Patent No. 5833891. Young TJ, Johnston KP, Mishima K, Tanaka H.. Encapsulation of lysozyme in a biodegradable polymer by precipitation with a vapor-over-liquid antisolvent. J Pharm Sci. 2000; 88: 640–50. Turk M, Hils P, Helfgen B, Schaber K, Martin HJ, Wahl MA. Micronisation of pharmaceutical substances by the rapid expansion of supercritical solutions (RESS): A promising method to improve bioavailability of poorly soluble pharmaceutical agents. J Supercritical Fluids. 2002; 22:75–84. Young TJ, Mawson S, Johnston KP, Henriksen IB, Pace GW, Mishra AK.. Rapid expansion from supercritical to aqueous solution to produce submicron suspensions of water-insoluble drugs. Biotech. Prog. 2000; 16:402–7. Pace, GW, Vachon, MG, Quebec, Mishra, AK, Henrikson, IB, Krukonis, V. Processes to generate submicron particles of water-insoluble compounds. 2001. US Patent No. 6177103. Williams RO, Johnston KP, Young TJ, Rogers TL, Barron MK. Process for production of nanoparticles and microparticles by spray freezing into liquid. 2005. US Patent No. 6862890. Rogers T, Hu J, Yu Z, Johnston K., Williams III R. A novel particle engineering technology: Spray freezing into liquid. Int J Pharm. 2002; 242:93-100. Rogers TL, Nelsen AC, Hu J, Brown JN, Sarkari M, Young TJ, Johnston KP, Williams RO 3rd. A novel particle engineering technology to enhance dissolution of poorly water soluble drugs: Spray freezing into liquid. Eur J Pharm Biopharm. 2002;54:271–80. Rogers TL, Nelsen AC, Sarkari M, Young TJ, Johnston KP, Williams RO 3rd. Enhanced aqueous dissolution of a poorly water-soluble drug by novel particle engineering technology: Spray freezing into liquid with atmospheric freeze-drying. Pharm. Res. 2003; 20:485–93. Hu J, Johnston KP, Williams RO 3rd. Spray freezing into liquid (SFL) particle engineering technology to enhance dissolution of poorly water soluble drugs: Organic solvent versus organic/aqueous co-solvent systems. Eur J Pharm Sci. 2003; 20:295–303. Hu J, Johnston KP, Williams RO 3rd. Rapid dissolving high potency danazol powders produced by spray freezing into liquid process. Int J Pharm. 2004; 271:145–54. Hu J, Johnston KP, Williams RO 3rd. Stable amorphous danazol nanostructured powders with rapid dissolution rates produced by spray freezing into liquid. Drug Dev Ind Pharm. 2004;30: 695–704. Chen X, Young TJ, Sarkari M, Williams RO 3rd, Johnston KP. Preparation of cyclosporine a nanoparticles by evaporative precipitation into aqueous solution. Int J Pharm. 2002; 242:3–14. Sarkari M, Brown J, Chen X, Swinnea S, Williams RO 3rd, Johnston KP. Enhanced drug dissolution using evaporative precipitation into aqueous solution. Int J Pharm. 2002; 243:17–31. Chen X, Vaughn JM, Yacaman MJ, Williams RO 3rd, Johnston KP. Rapid dissolution of high-potency danazol particles produced by evaporative precipitation into aqueous solution. J Pharm Sci. 2004; 93:1867–78. Vaughn JM, Gao X, Yacaman MJ, Johnston KP, Williams RO 3rd. Comparison of powder produced by evaporative precipitation into aqueous solution (EPAS) and spray freezing into liquid (SFL) technologies using novel Z-contrast STEM and complimentary techniques. Eur J Pharm Biopharm. 2005; 60:81–9. Kipp JE, Wong JCT, Doty MJ, Rebbeck CL. Microprecipitation method for preparing submicron suspensions. 2003. US Patent No. 6607784. Radtke M. Pure drug nanoparticles for the formulation of poorly soluble drugs. New Drugs. 2001; 3:62–8. Kozyuk OV. Device and method for creating hydrodynamic cavitation in fFluids. 2003. US Patent No. 6502979. Junghanns JU, Buttle I, Muller RH, Aranjo IB, Silva AK, Egito ES, Damasceno BP. Solemuls technology: A way to overcome the drawback of parenteral administration of insoluble drugs. Pharm Dev Technol 2007;12:437-45. Saffie-Siebert R, Ogden J, Parry-Billings. Nanotechnology approaches to solving the problems of poorly soluble drugs. Drug Discovery World. 2005; 6: 71-6. Discher. D. Shape Effects of Filaments versus Spherical particles in flow and drug delivery. Nat Nanotech. 2007; 2:249–55. Rana S, Gallo A, Srivastava RS, Misra RD. On the suitability of nanocrystalline ferrites as a magnetic carrier for drug delivery: Functionaliza-tion, conjugation and drug release kinetics. Acta Biomat. 2007; 3:233–42.